We were scanning the web today and came across a great article from our friends at autoblog.com. It shows you some of the new technology Ford unveiled at CES this year. We think it’s pretty darn sweet and can’t wait to get our hands on one. Come on 2011 model year cars! We need our gadget fix. Make sure to check back with your Maryland Ford Dealer to see what models will have this available. Ford began its MyFord Touch presentation with a simple question: “People line up for iPhones – why not cars?” What is it about certain pieces of technology that makes them a “must have”? And since the iPhone is really just a merger of two things we already have (a cell phone and PC), is it possible to blend something into a car that will get ’em lining up around the block? Quite obviously, Ford’s hoping the answer is yes. 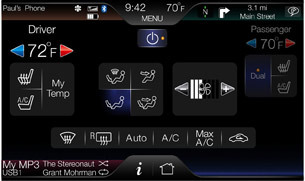 MyFord Touch – and if you buy a Lincoln, MyLincoln Touch – is a piece of driver connect technology like SYNC, only much more advanced. In fact, you can think of MyFord as SYNC 2.0. Or, you could, if not for the fact that there already is a SYNC 2.0. Regardless, in-car technology can do myriad of things these days, and Ford thinks it’s found a way to group and display all of a vehicle’s functionality in a logical, intuitive and useful way. Sadly, Ford is internally calling this “simplexity,” as in making the complex simple. Or, as we wrote in our notes, “barf.” Thankfully, the public will know it as MyFord Touch. Ford wants you to think of MyFord Touch as an electronic Swiss Army knife. Physically speaking, here’s what you get: A large, eight-inch touchscreen display in the center stack, two 4.2-inch LCD screens to the right and left of an analog speedometer (the exact same screens you’ll find in the Fusion Hybrid) and two steering wheel-mounted five-way button controls. 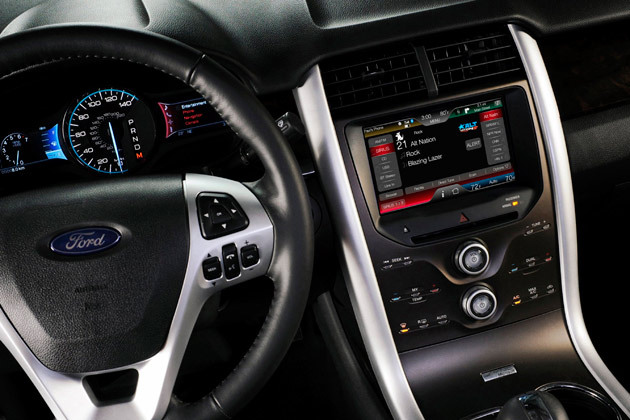 Using Ford’s award-winning HMI (human-machine interface) setup, MyFord Touch seeks to allow a driver to control in-car technology through either voice, touch or the wheel-mounted controllers. 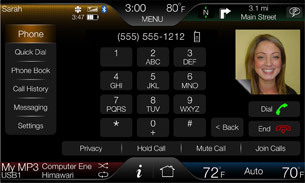 As Ford termed it, VUI (voice user interface), TUI (touch user interface) and GUI (graphic user interface). As far as the large, eight-inch touchscreen goes, its four corners each contain a button for one of the four groupings. Phone is brown, Navigation is green, Entertainment is purple and Climate is blue. 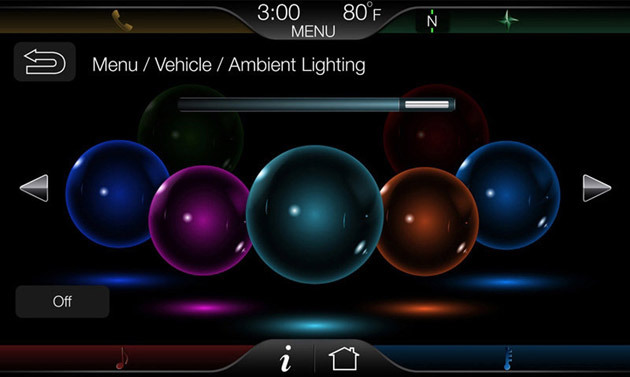 We haven’t had a chance to play with MyFord Touch yet, but we understand that the system is quite customizable. Don’t like that shade green? Think Climate should be red and not blue? Not a problem. Returning to the two 4.2-inch LCD screens, the one to the left contains all your usual mileage and fuel information: trip computer, radar cruise control distance indicator, vehicle information and even a tachometer, if you like. In other words, information directly related to operating the car. The screen on the right however, displays information from the four MyFord Touch groupings. The idea is that after a little practice, you will be able to know which group you’re looking at simply based on color – you won’t have to read anything – and your eyes will spend more time on the road. A noble goal, for certain. Going with that mantra and/or old Doors song, the five-way thumb controls (up, down, left, right, click) keep your hands on the wheel. The left controller is for the left screen, and (shockingly) the right is for the right one. 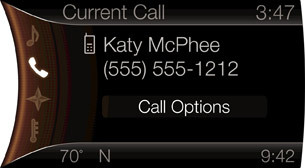 Of course, even better than using a touchscreen or working wheel buttons is using your own voice. Ford assured us that the voice recognition system shipping with MyFord Touch is much more conversational than the VR system currently shipping with SYNC. Instead of talking your way through a series of menus (SYNC asks you what source you want, for example iPod, then asks you what track or artist), MyFord Touch should just require you say, “Play ‘John the Fisherman’ by Primus” and be done with it. Emphasis on should. Here’s a couple of nifty details, and please keep in mind that we didn’t get to play with MyFord Touch – yet (expect a video coming soon out of CES). Users will be able to take all of their MyFord Touch settings with them from vehicle to vehicle – just plug in an SD card or flash drive and you’re good to go drive another MyFord Touch-equipped car. Your color scheme, your radio presets, your music tags, your seat position – whatever – all go with you. It will even welcome you by name, no matter the car. 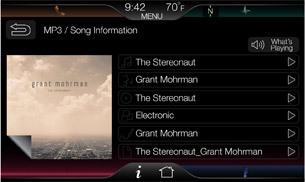 With the music tags, MyFord and MyLincoln Touch are the first systems that allow you to tag songs on the fly. Ford didn’t go into great details on this, but we imagine you could would be able to hear something on the radio, tag it, and then let MyFord Touch search for it. This could be especially cool with the SYNC app that lets you listen to internet radio. 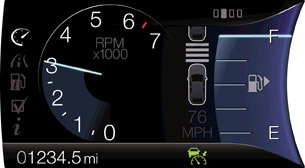 Besides all the little details, the big picture we took away from the MyFord Touch is Ford is serious. These people knew going halfway wouldn’t be good enough. The screens are beautiful. 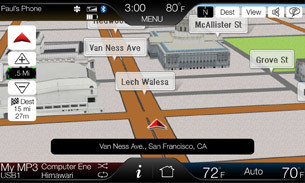 Before seeing MyFord Touch, we already thought that Ford had the best navigation/entertainment stuff in the industry (SYNC is really, really good – especially with Sirius Travel Link). MyFord Touch brings Ford a generation (or two) beyond the competition. In other words, no one could even compete with Ford’s old stuff. How on earth will they manage against MyFord Touch?